This historical and beautifully incised horse is carved right above the very colorful lichen on this sandstone wall. 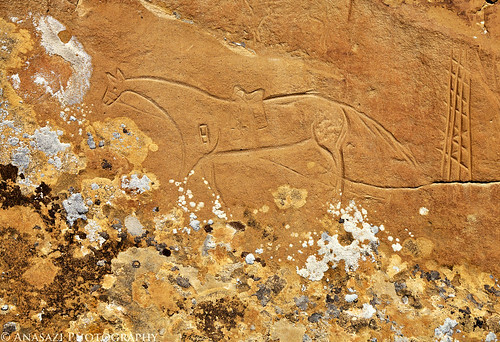 It is believed that this horse was most likely created by a Ute which may depict their encounters with the U.S. Calvary. The number ‘8’ on the front hip of the horse is most likely a brand that has been traced back to General Crook’s command, who was chasing the Apache through Arizona and New Mexico in the late 1800s. It’s possible this carving may be of a captured horse. While visiting this site, the biting gnats were terrible! If I stopped moving for more than a few seconds they swarmed around me and were unbearable. As I searched the area I was lucky to find a few of the petroglyphs, including this one, and managed to pull off a few photos before the bugs overran me. I’m sure I missed some petroglyphs at this site since I had to keep moving, so I will need to return another time to finish exploring.